Cast: Kangana Ranaut, Shahid Kapoor & Saif Ali Khan. 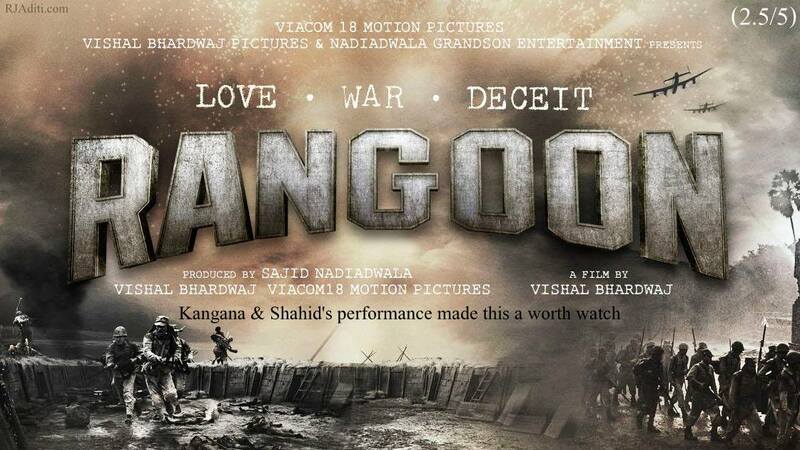 One of the most awaited film of the year Rangoon ka best part koi hai to wo hai cinematography and the star cast. War story thi ya love story ya fir dono ki khichdi, samaj hi nahi aaya… pyaar ke naam pe 3 gaane aur deshbhankti ke naam pe 3 -3 baar National Anthem jab aaya tab mann hi mann mei mujhe laga is-se achchi to Ghazi Attack film thi, kam se kam point to point baat to thi. But anyway Vishal Bhardwaj ki film waise bhi unke liye hai Jinhe cinema ki zyada samaj hoti hai & truly speaking its a tread for typical cinema lovers but for masala movie lovers – thodi okaish film hai. Partly dekhne jaao to taarif ke liye bahot kuchh hai par over al 2 ghante 47 min ki film ke hisaaab se dekho TO LOCHA!! sharing my liking/disliking quickly. Best Part: Kangana Ranaut & Shahid Kapoor. Outstanding performance by both of them. I love the most: Beauty of the each and every frame. mind blowing locations and camera work. Too much ho gaya: Story and length. could have been better. Song i Loved the most: Yes Ishq hai sung by Arijit Singh, penned by Gulzar & composed by Vishal Bhardwaj.